King Harald also inherited this diamond tiara from his late mother. The piece originally belonged to Queen Josefina of Sweden; it was probably made around the 1820s. Josefina bequeathed the tiara to her granddaughter, Queen Lovisa of Denmark; she in turn bequeathed it to her son, Prince Gustav. When he died in 1944, he left the tiara to his niece, Crown Princess Martha of Norway. The tiara is another piece used exclusively today by Queen Sonja. 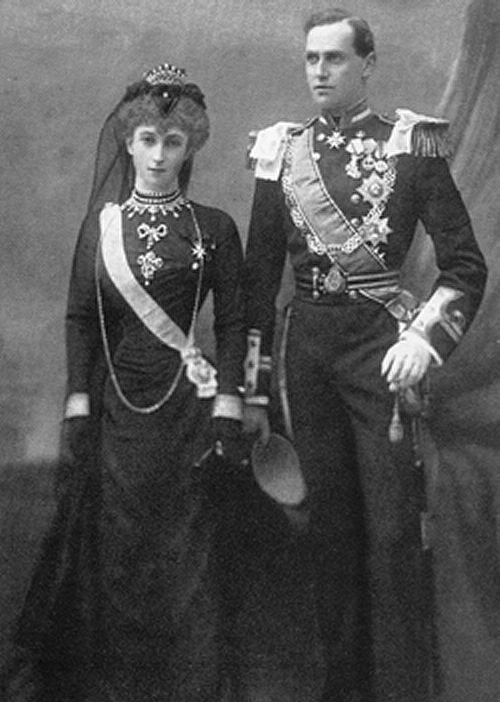 When King Haakon VII and Queen Maud of Norway married in 1896, she received a diamond and pearl tiara from her parents, King Edward VII and Queen Alexandra of the United Kingdom. 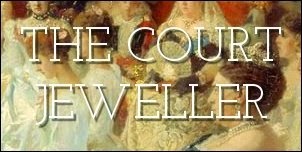 It was one of the jewels left behind in England when Maud unexpectedly died in 1938; it was not worn again until after King Harald married Queen Sonja in 1968. In 1995, the tiara was sent to Garrard in London to be cleaned, and thieves stole it from the company's workshop. They constructed a replica tiara, which is mainly worn now by Queen Sonja. The smaller version of the tiara was worn by Princess Martha Louise at her wedding in 2002, and it was also worn by Crown Princess Mette-Marit at the wedding of Crown Princess Victoria of Sweden in 2010. When Queen Maud was still Princess Maud of Wales, her grandmother -- Queen Victoria of the United Kingdom -- gave her a small, fan-shaped diamond tiara as an eighteenth-birthday present. The tiara traveled with Maud to Norway, and today it is in the collection of King Harald and Queen Sonja. Sonja wore the tiara a few times when she was Norway's crown princess, and Crown Princess Mette-Marit wore it as a necklace during the celebrations before her wedding in 2001. 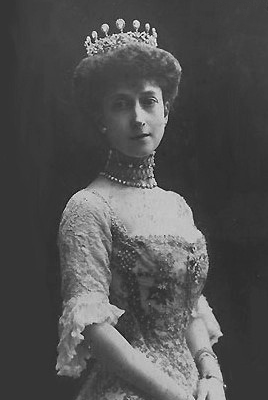 Another of Queen Maud's wedding gifts was this diamond tiara, which was presented to her by her "Lady and Gentleman Friends." The tiara could originally be worn with turquoise elements, although today it is only worn in its all-diamond form. After the deaths of Queen Maud and Crown Princess Martha, this tiara was eventually inherited by Princess Ragnhild, King Harald's eldest sister. When she died in 2013, the tiara was reportedly returned to the Norwegian royal vaults. Jewel watchers have been anxiously awaiting its reappearance in public. When Queen Maud's mother, Queen Alexandra, died in 1925, Maud inherited this elaborate turquoise and diamond circlet from her. Today, the tiara belongs to Maud's granddaughter, Princess Astrid, who is King Harald's sister. She is still active in royal events in Norway, and she often wears her great-grandmother's turquoises in public. Queen Maud also inherited this diamond circlet from her mother, Queen Alexandra, in 1925. Alexandra had the circlet made during her tenure as queen consort as a lighter alternative to the heavy George IV State Diadem. It originally also had diamond fleur-de-lis elements interspersed with the Maltese crosses; these were removed by Queen Maud. The piece is currently owned by King Harald and Queen Sonja. One of the newest tiaras in the Norwegian collection is this ultra-modern gold tiara, which is part of a larger parure of gold jewelry. The piece belongs to Queen Sonja; some have suggested that it was a 60th birthday gift from King Harald. The central element is removable, and the tiara can be worn with a gold and diamond element, a diamond and green tourmaline element, or a diamond and orange topaz element. This modern amethyst tiara, which is a converted necklace, was originally in Queen Sonja's collection, but today many think it has been given to her daughter-in-law, Crown Princess Mette-Marit. The piece was also loaned to Princess Martha Louise for the wedding of Crown Princess Victoria of Sweden in 2010. This tiara, owned today by Princess Astrid, is a part of a parure of jewelry made of gold and semi-precious stones that originated with the Nassau family. It arrived in the Swedish royal collection with Queen Sofia, who then passed it along to her daughter-in-law, Princess Ingeborg. She gave the set to her granddaughter, Princess Astrid, who has been wearing it at royal events ever since. When Princess Martha of Sweden married Crown Prince Olav of Norway in 1929, the city of Stockholm gave her this tiara. The piece had been made by C.F. Carlman out of diamonds and platinum. Princess Astrid inherited the tiara from her mother, and she still wears it today. Crown Princess Mette-Marit of Norway wore this petite bandeau of diamond daisies at her wedding to Crown Prince Haakon in 2001. The piece was reportedly made around 1910, and it was her wedding gift from her new in-laws, King Harald and Queen Sonja. Fifteen years after she received it, the bandeau is still Mette-Marit's most-worn tiara. Princess Martha Louise, King Harald and Queen Sonja's daughter, has worn several tiaras, but she also owns one of her own: this diamond and pearl tiara, which features design motifs that resemble small ears of wheat. The piece was Martha Louise's eighteenth-birthday present from her grandfather, King Olav V.
Crown Princess Martha's wedding gifts in 1929 also included this diamond bandeau, which could also be worn as a bracelet. Made by K. Andersson, it was presented to her by her uncle and aunt, King Gustaf V and Queen Victoria of Sweden. Today, the piece belongs to Princess Astrid, who wears it occasionally. Princess Astrid owns two diamond aigrettes that share the same base. The first is this piece, which is made of diamond wings. The piece reportedly belonged to Astrid's grandmother, Queen Maud. Princess Astrid's second aigrette is this piece, a pair of antenna made of rubies and diamonds. It can be affixed to the same base used for the diamond feather aigrette. If you could wear one of the Norwegian royal tiaras to a state banquet, which piece would you choose?